If you want a consistently significant performer on both sides of the ball, you want Manny Machado. If you want a player with an enormously high ceiling along with below average defense and occasionally mediocre seasons, you want Bryce Harper. In my recent infatuation with WAR, I was amazed to learn that Bryce Harper had a WAR between 1.1 and 1.5 in 3 of his last 5 seasons (literally every other year). For a player who is expected to earn the richest contract ever, that is quite a revelation. Of course, he did post a WAR of 10.0 in his MVP 2015 season. Therein lies the infatuation. Manny Machado, on the other hand, ranged between 2.3 and 7.1 WAR in the last six seasons. Less of an upside and less of a downside. When you are deciding who you want the Phillies to chain themselves to over the next decade, the above details are something to consider. In large part because of the position he plays, Machado's WAR (which includes offense and defense) is likely to be higher over the course of his contract than Harper, at least that is what history suggests. Harper is slightly better offensively (27.4 career oWAR compared to 25.7 for Harper), but Machado dominates Harper defensively with a 11.3 dWAR compared to Harper's -3.0). 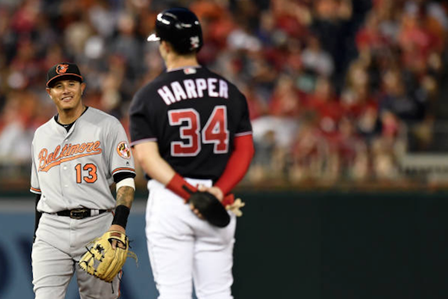 In their seven seasons in the big leagues, Machado has a career 33.8 WAR compared to 27.4 for Harper. By the way, Harper has played one single game more than Machado in his career, so we are comparing apples to apples in that regard. This partially explains why Harper is the more popular choice among fans (and John Middleton? ), while Machado is the preferred choice among Phillies executives. Harper's 10.0 WAR season is why he was so hyped from day one and is the type of season fans dream about. The draw to Machado for the Phillies is that he plays a more difficult defensive position at a high level (particularly at third base) and is a more consistent offensive player, albeit with a little less flash. As far as the Phillies are concerned, WAR seems particularly useful in determining how this plays out on a team level. Based on WAR, I pointed out in my last post that the the Phillies are in line for about 89 wins. Using that as our baseline (feel free to adjust that number to whatever number of wins you expect), how much would the Phillies improve by adding Machado or Harper? Machado has added between 4.6 WAR and 6.9 WAR per full season (prorated) throughout his career - that would give the Phillies as a team between 93.5 and 96 wins in 2019. The range for Harper is between 1 and 10 WAR, or between 90 and 99 wins as a team. Just something to else to think about in the ongoing, neverendingly frustrating WAR between Machado and Harper.